Most of you would know that I co-authored with Professor Hugo, NUH, a book ‘Living with Eczema: Mom Asks, Doc Answers‘ published last year. As an end of the year special, I picked five questions asked and Professor Hugo’s reply (almost half the book is Q&A, I picked these 5 based on being common questions parents of eczema children asked). The book is structured with information surrounding key topics like diagnosis, prevention, triggers, treatment including things that don’t work and future research, followed by Q&A. 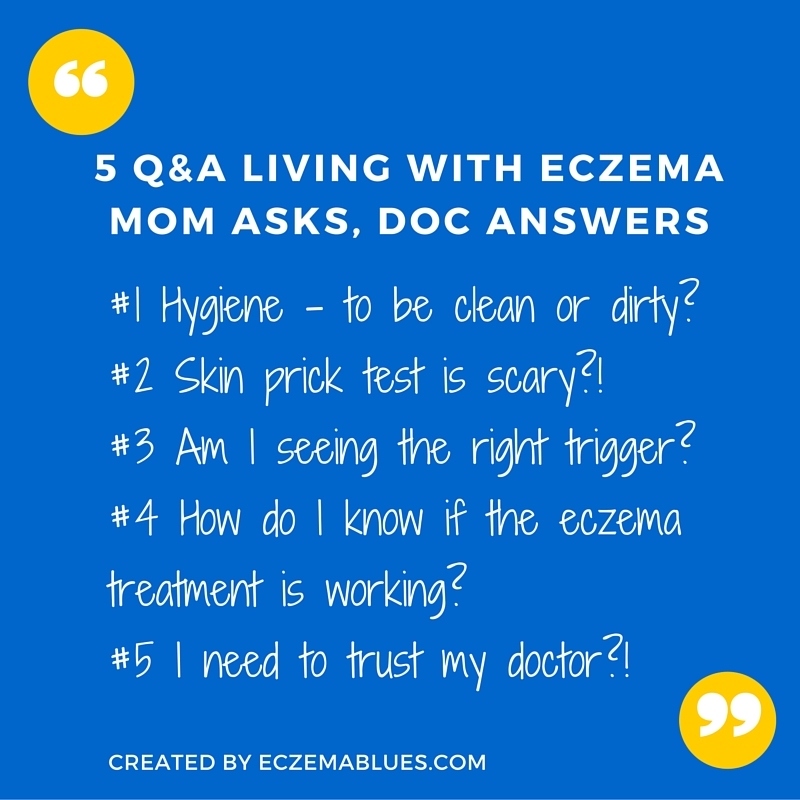 None of the questions I asked were ‘screened’ as we wanted to keep it as an authentic exchange between a mom and the doctor of her eczema child. MarcieMom: The Hygiene Hypothesis has been interpreted by some to mean they should expose their infants to dirt, and possibly, avoid the use of anti-bacterial products. Is this recommended? Infants with defective skin barrier or lower immunity would be even more susceptible to the penetration of irritants or allergens, or more susceptible to bacterial infection. So, should a mother take more hygiene precautions for her high-risk infant? Professor Hugo: In theory this is correct, but the problem is that every baby is unique and needs a different degree of exposure of immune stimuli. This is very difficult to assess in a baby. However, in general, products that destroy the body’s own bacteria, such as antibiotics, should be avoided and only given if necessary (in case of a bacterial infection). There have been studies showing that early administration of antibiotics increases the risk for subsequent allergy, including eczema. Hygiene precautions taken by parents seem to have little impact on the development of eczema. MarcieMom: While the skin prick test (SPT) is a faster, more reliable and cheaper option than the blood test, I have heard of parents avoiding it because the name “skin prick” test sounds traumatising for the child. What do you do in your practice to encourage fearful parents to let heir children take the SPT? Professor Hugo: A good SPT, performed by an experienced person, should be painless. In our department we say that a SPT should be associated with no blood and no cry, even in infants. MarcieMom: In your experience, how reliable are patients’ observations in relation to what is triggering his/her eczema? Professor Hugo: Most parents fail to identify the triggers of their child’s eczema, or come up with lists that are non-reliable. Don’t forget that eczema is a chronic disease, needing a chronic or regular trigger. This is very diffi cult to identify, especially when a house dust mite allergy is involved, which can mimic multiple food allergies. MarcieMom: How long should a patient use the prescribed corticosteroid before giving feedback to the physician of no noticeable improvement in the eczema? Professor Hugo: Although corticosteroids are still the cornerstone treatment of eczema patches, they are only part of the holistic treatment of eczema. If all measures are taken appropriately, an effect of corticosteroids should be seen within one week. Most children can be treated with mild corticosteroids; only in severe eczema are more potent corticosteroids necessary. MarcieMom: How do you build trust and relationship with your patient? Professor Hugo: In a nutshell: be honest, don’t lie, and focus on limitations. There are many more Q&A in the book and if you like to read it for free and you live in Singapore, it’s available in our national libraries island-wide. Wishing all families with eczema kids a happy new year and your encouragement keeps me going and faith that I’m storing treasures in heaven in this blog ministry. Just like the book, this blog is also dedicated to you. this book will help all of them. Kickstarting 2016 with Friday Eczema Kids Activity!